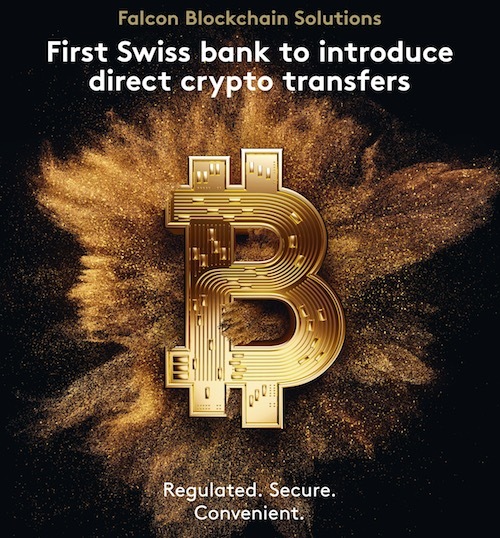 Zurich-based Falcon Private Bank has unleashed direct transfers of selected cryptocurrencies for both private and institutional clients. Falcon, which offers banking on blockchain, says clients can directly move cryptocurrencies – Bitcoin, Bitcoin Cash, Ether and Litecoin – to and from segregated Falcon wallets, and convert them into fiat money. This new offering “makes blockchain assets fully bankable”. Clients can place trading orders through e-banking or a relationship manager. Digital assets are included in portfolio statements and tax reporting documents. Falcon provides storage via its proprietary custody solution. In terms of anti-money laundering (AML) and know your customer (KYC) laws and regulations, Falcon’s protection covers hardware, software and the transaction process. Its custody solution has been audited and reviewed by independent providers. The bank has its headquarters in Zurich, but also has locations in Dubai, London and Luxembourg.